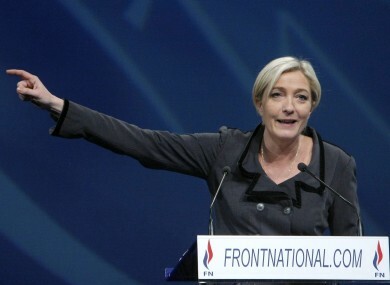 The president of the National Front, and daughter of its divisive founder, is the most popular candidate for president. Far-right leader Marine Le Pen is the most popular potential candidate in France's presidential election, according to a new opinion poll. NICOLAS SARKOZY HAS been dealt a surprise blow in his ambitions to win a second term as President of France – coming tied for second place in an opinion poll, two points behind the leader of the far-right National Front party. Marine Le Pen, who took over as the president of the party in January succeeding her father Jean-Marie, commands the support of 23 per cent of voters in the poll, published in the Le Parisien newspaper yesterday. The incumbent Sarkozy commands 21 per cent of support, as does the leader of the main opposition Socialist party, Martine Aubry. Though the election is still14 months away, the poll will come as a bitter blow to the president – whose political agenda, the Daily Telegraph explains, has come to be dominated by topics like Islam and immigration, on which the National Front is perceived as strong. It adds that the poll should be viewed in the context, however, that none of the main parties has officially declared a candidate – with the poll also leaving out a likely front-runner, IMF head Dominique Strauss-Kahn. The BBC further adds that the poll has come under attack, with spokespersons from the more mainstream parties suggesting the poll – conducted online – was open to manipulation and virtual ballot-stuffing. Nonetheless, the spike in her approval is significant: in polls taken last year, before she took the party leadership, she took between 11 and 13 per cent, the Wall Street Journal notes. Jean-Marie Le Pen made international news in 2002 when he took a surprise second place in that year’s presidential election, forcing his way into a run-off election at the expense of the highly-fancied prime minister Lionel Jospin – taking 16 per cent of the vote, a much smaller share than his daughter took in the virtual poll. French electoral law requires a run-off election to be held if no candidate takes more than 50 per cent of the vote in the first round of voting; no candidate has passed that threshold on the first round of polling for decades. Sarkozy was narrowly elected in 2007 following a run-off with the Socialist Party’s Ségolène Royal. Email “Le Pen takes surprise lead in French presidential polling”. Feedback on “Le Pen takes surprise lead in French presidential polling”.